The most successful people in the world are the ones who’ve found a way to take advantage of their natural talents in the course of their daily activities. You can wander through life, stumbling upon your natural talents as situations arise, or you can take control and purposely tap into your potential. Imagine the power of having this information at your finger tips! No more guessing - you'll be in the driver's seat. Create the business of your dreams or choose the career that fulfills you. Build and nurture meaningful relationships with your family, friends and the other people in your life. The practical applications and possibilities are limitless. Life is a journey, not a destination - and that's what makes it fun! There are many roads to choose from and we all face new options every day. Which road to take? Will it lead us to the places we want to be - happy, successful, fulfilled? 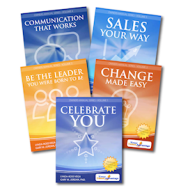 With the Your Talent Advantage Owner's Manual you know your natural strengths and skills. The Your Talent Advantage Success Road Maps build on that knowledge and provide you with customized practical application techniques and actions you need to put that knowledge to work for you. Partnerships are a fundamental part of life and can accomplish great things. They can also crash and burn with disappointment, frustration, and loss. Successful partnerships leverage the strengths of the partners to achieve shared goals. Sounds simple. But many partnerships fail. How do you create successful partnerships? The keys lie in understanding value, strengths, and challenges. Success is the ultimate goal of any business, yet it's impossible to achieve as an entrepreneur unless you take the time to really understand yourself and the unique skills you have. Who you are, how you see the world, and your natural skills impact every aspect of your business - the products and services you offer, the business model you choose, how you promote and market , the clients you attract, and so much more. One of the biggest challenges in coaching (as in life) is communicating with people who see the world differently than you do. In coaching the stakes are high because your clients’ success depends on your ability to communicate with them on their terms. Perceputal Style® Theory and Your Talent Advantage® are Registered Trademarks of Vega Behavioral Consulting, Ltd.